LOBE LOVE LOVE this hair dryer. Has one as a teenager and my dad appreciated the cord keeper function. This dryer is fast and has just the right amount of heat. I have very thick wavy hair. I could not wait to try this hair dryer! My hair is either colored or dried out through processing. I am always putting the right things in my hair but, somehow my old blow drier makes it look like it is really dried out and by the 2nd day looks frizzy. I tried the conair infiniti hair dryer today, and I was amazed. It dried my hair in half the time on the low setting!! The results were fantastic, my hair looked soft and it fealt soft too!! I am so happy that I purchased this hair dryer!! I would reccomend this hair dryer, because the results are fantastic!!! I've always had Conairs and this is the best one I've had yet. I don't believe in paying more than drugstore prices for hair dryers since they never last more than a few years. I look for three main things in a hair dryer: cool button, high and low settings, and a concentrator nozzle. This one has all three, plus warm and hot settings, a diffuser, and (total bonus) a retractable cord. And it's pink! I have long, straight-ish hair which frizzes at the ends. This hair dryer gave me great volume, shine and totally smoothed out the frizzy ends. The diffuser attachment is a must, along with a low, cool setting. It takes longer to dry, but the results are worth it. I'm sending one to my mom as well. I gave it four stars because it's so big and heavy. I have been using this hairdryer now for a few weeks and am pleased with its performance. It gets very hot reducing the time to dry the hair. While I would not suppose to understand why, ( ionic) it does seem that even though I am using hot air on colored hair I do not experience the fuzzies that I had with my old dryer. SO there may be something up with that. My only complaint is that I like a much longer cord. But I think most people would find it sufficient. I would not hesitate to purchase this dryer as a gift, its pretty and a good product. I love this Conair hair dryer. It has been great. It dries my hair quickly & doesnt leave it frizzy!! I think it is awesome for the price. 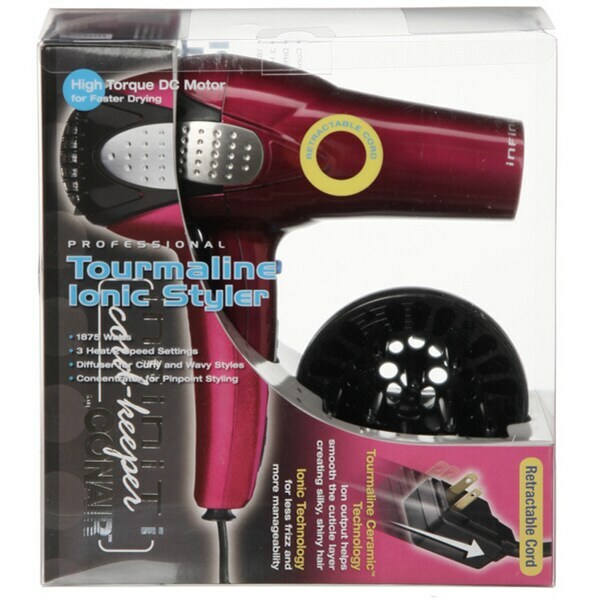 I would recommend it to anyone that wants a great hair dryer but doesnt want to spend a fortune. dries my hair fast and makes my hair easier to manage after drying. I also find the retractable cord a plus, especially when I am "rushing". So far, great product, definately recommend. Nice hair dryer with retractable cord (best feature). Not as powerful as my old Conair. Mine is purple, not pink, like so many indicated it would be. Not a problem, just FYI. Bought this hair dryer as a gift for my daughter-in-law and she absolutely loves it. She has curly hair and and the diffuser works great for her. Love my On-air hair dryer 2with attachments. Light weight and heady to hold. I really like the retractable cord button so it is easy to put away. Dryer works well. I like the attachments for those hair special days. Really like the overall package. I'm pleased that I purchased this dryer. This dryer is definitely the best one I've ever owned. It's fast and leaves my hair smooth. I researched this dryer online and it has had rave reviews for several years. Needed a retractable cord! Sometimes difficult to find. The dryer is actually purple, which isn't a problem. Shipping was slower than usual and the box looked like the dryer would be damaged, but well wrapped inside. I was looking for a hair dryer that had a retractable cord & found there just weren't that many available. But I searched & searched & of course found this one on Overstock. It's well made & has just the right settings. I love the purple color too! Wow! A great job drying hair. A good hair dryer for a very reasonable price. It works as expected after using it for more than a month. It seems to dry my hair quicker than my previous dryer. As silly as it sounds, my husband " stole" my hairdryer and keeps it in his bathroom. The beautiful rose pink hairdryer is definetly only to be used by the girls in this house!! Hair Dryer Fact Sheet from Overstock.com. Our guides provide customers with information about hair dryers. How to Choose the Best CHI for Your Hair Type from Overstock.com. There's a CHI flat iron for every hair type. Here's how to find the straightener that's right for you.